Your tooth is out of your mouth. Now what? If your adult tooth is knocked out completely, the clock is running. You only have about a half hour for the best, most predictable outcome! An hour and there’s still some hope. Hold tooth by the “crown”. The chewing or visible part in your mouth. We don’t want to injure the remaining tissue cells on the root. We’ll need those to help reattach the tooth in the bone. The best thing you can do is put it back in the person’s mouth where it came from immediately after it is rinsed. Unfortunately most people aren’t able or willing to have that done. If you have some milk or saline solution (contact lens solution), put the tooth in it or place and hold the tooth in your cheek. If you put it in the cheek be sure not to swallow it. Don’t let the tooth get dry. Contact Us at (513) 896-1573 ASAP or go immediately to the emergency room. *If your tooth just feel out on it’s own due to gum disease there is no chance of getting that particular tooth back in your mouth. A replacement will need to be made. If the bone and gum tissue isn’t completely damaged and the roots of the teeth aren’t broken you have a good chance of saving your tooth, but only if you can get it back in the socket within a half hour to hour. 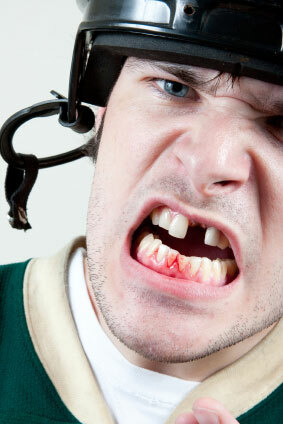 In some rare cases the tooth will heal and no further treatment will be needed. Often however a root canal will need to be performed. This will save your tooth. If this fails to due to the severity of the injury you can still have something made that looks natural and functions well. We can also help with any tooth replacement or repair needs. Contact our office at (513) 896-1573 to schedule a dental consultation.